Commercial grade 0-10 V to PULSE WIDTH MODULATION ( PWM ) LED DIMMER for LED lights & DC motor speed control & for converting power drivers to dimmable LED drivers. Controlled with 0-10V signal sinking or sourcing or 100 KOHM potentiometer. Operating Voltage 11VDC to 24 VDC. @10 A.
AD110 Wall mount version LED PWM dimmer mounts on a 1 gang face plate. 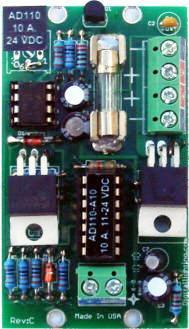 AD110-A10 LED PWM dimmer controllable from industry standard 0-10 V analog controllers or by using a 100 KOHM potentiometer. It is supplied as a Printed Circuit Board Module for OEMs and for integration in power supplies and LED Drivers & light fixtures. The AD110-A10 is the dimmer of choice adopted by many LED lighting manufacturers. DMX512 Dimmers and Switches for use with LED lights. PULSE WIDTH MODULATION ( PWM) DIMMER Common Positive Controls Negative side. Advanced MOSFET output generates no heat and requires no heat sinking device. Voltage Regulated control circuitry provides smooth and flicker free dimming from 0% to 100 %. Control input Sinking Current : 0.6 mA. Board dimensions: 2.80" x 1.60" x 0.60"
PWM LED dimmer controllable by any 0-10 V wall dimmer or 0-10 V controller, sinking or sourcing or from any 100 K OHM potentiometer. Control in : 0 - 10V; 0.6 mA or 100 K pot. @ 10 Amps Max. load. LED PWM dimmer ( AD110-A10 ) potentiometer control & ON/OFF preset switch. The AD110-A10 could be connected to PWM-R11 to dim more LED lighting loads connected to different power supplies without the need to run control wires. a repeater amplifier that converts Common Positive dimmers to Common Negative dimmers for automotive applications. For 12 VDC applications with Common Negative wiring.